1 Preheat the oven to 220°C, gas mark 7. Rub the pork belly flesh with the dry five spice, and rub the oil and some salt into the scored skin. Place on a rack over a roasting tin of just-boiled water and roast for 15 minutes, then reduce to 150°C, gas mark 2 and cook for 2 hours until the meat is tender. 2 Meanwhile, place the plums and shallots in a separate large roasting tin, add the cinnamon stick, star anise, chillies, sugar, wine and chicken stock. Place in the oven with the pork to cook for 40-50 minutes until soft. Remove from the oven, leave to cool and spoon into a serving bowl. 3 Remove the pork from the oven and place on a board, pull away the crackling and cut into portions, then shred the flesh. 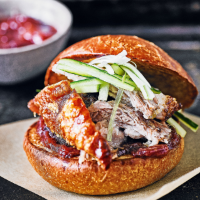 Serve piled into the toasted buns, topped with some plum sauce, cucumber and salad onions. If the crackling isn’t crisp at the end of the cooking time, increase the oven temperature to 220°C, gas mark 7 and return the crackling to the oven for a further 15 minutes or until it is crunchy and crisp. This recipe was first published in Thu Nov 02 12:02:00 GMT 2017.